The Warp Star (ワープスター, Warp Star), also formatted as Warpstar, is an item appearing in Melee, Brawl, Smash 4 and Ultimate that, when picked up, sends a player flying off into the sky and crashing back down into the stage with an explosion that deals 22% damage and high knockback. It is possible to control the landing location by pressing left or right on the Control Stick while the player is flying. Because of this, it is possible to miss the stage and self-destruct. In Ultimate, it is also possible to slightly control the flight duration by pressing up or down on the Control Stick during flight. If a character is hit when the Warp Star is first grabbed, the item can be "dropped" before it can be used. The Warp Star can then be regrabbed and used normally. A shield will not protect against the star's impact (except for a few frames of Yoshi's shield with proper timing when he has invincibility frames), so the only way to avoid damage is to not get struck or sidestep with the correct timing. Since Warp Stars crash into the stage from above, they can be used to "leap" to a higher part of the stage. Therefore, stages with many platforms can limit its effectiveness (and, in the case of scrolling stages with high off-screen platforms such as Rainbow Cruise or Rumble Falls, can even cause an SD). The Warp Star's ability to travel left and right before landing seems to have been diminished from Melee to Brawl. A player is invincible while riding on the Warp Star; if it hits a Bumper, it will pass through it. The crash landing can also meteor smash those hit. Kirby rides on it in his on-screen appearance in SSB, Brawl, Smash 4, and Ultimate. Characters riding on Warp Stars can also bounce on shells if they land precisely on them. The Warp Star in Kirby Star Allies. The Warp Star has a very large role in the Kirby series. It has appeared in nearly every single Kirby game to date. In every one, it has served as Kirby's mode of transportation. When he touches the Warp Star, Kirby flies it high off the screen, then "crashes" back down in another location. In various games, Kirby is able to summon it with a cell phone. It is stated in the anime and implied in Kirby & The Amazing Mirror that a Warp Star is the trademark of a hero. The Warp Star in Melee. The Warp Star is an item that allows players to crash land on their opponents. The Warp Star appears as one of the unlockable Trophies. Warp Star trophy in Melee. 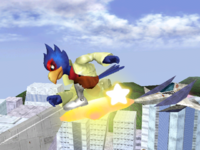 Falco riding a Warp Star in Melee. 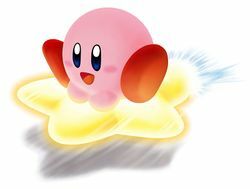 The Warp Star originated as Kirby's ride: it helped the ponderous puffball get around at high speed. Hop on the Warp Star in Super Smash Bros. Melee, and your character will rapidly launch up and off the screen. You'll return in a flash, causing an explosion as you hit the ground. Try holding a direction to alter your landing. The explosion caused by the Warp Star in Brawl. The Warp Star acts the same as it did in Melee. Warp Star trophy in Brawl. A warp-speed item. In the Kirby series, Warp Stars are used to move between stages. In Smash Bros., they're ultrafast attack items that zoom up and down to devastate anyone they hit. You can shift your landing spot by moving the Control Stick left or right during your descent. Choose your target and hang on! Don't overshoot the mark and plummet off the stage, though. The Warp Star acts the same as it did in Brawl. The Warp Star appears as one of the unlockable Trophies in both versions. A magical transportation device that Kirby has used in the past to get around. Jumping on the Warp Star will send the character high into the sky and then crashing back down to the battlefield. Anyone caught in the path or landing spot will be sent flying, and the rider can aim a bit to the left or right in the air. Jigglypuff on a Warp Star in Ultimate. The Warp Star acts the same as it did in Smash 4. However, it is also given the ability to stall in the air for a few seconds, granting the user more unpredictability. Kirby also uses the Warp Star to escape Galeem. The Warp Star in SSB during Kirby's on-screen appearance. The Warp Star in Brawl during Kirby's on-screen appearance. The Warp Star in Smash 4 during Kirby's on-screen appearance. Artwork of a Warp Star in Ultimate. 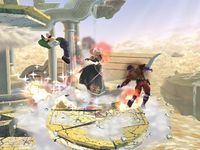 In Brawl, if one pauses the game at the right moment as they go off-screen, they can see most of the stage to the point of seeing beyond the stage's boundaries. In Melee, there is a glitch that can occur when a player uses a Warp Star: If the player tries to pick up a Warp Star just as an opponent attacks the player, the Warp Star will attach itself to the player. When thrown, it will then fly off the stage. This can be seen here. In Super Smash Bros. 4, the Warp Star's sound effect was changed to become the actual sound that the Warp Star makes in the Kirby series. In Brawl, if used on the Shadow Moses Island stage while a full wall is up, it is possible to pass over the wall. The player is then stuck there until they self destruct or the wall is destroyed. In early versions of SSB4, a glitch could occur when using a Warp Star, in which the game thought the Warp Star was a platform going over the upper blast line, KO'ing the user. This page was last edited on April 23, 2019, at 12:03.